The 2009 Mittelwest Bezirks Heimatfest took place in Milwaukee, WI on March 28. D'Oberlandler Milwaukee were the hosts this year. The young Trachtler who participated in the Einzelplattler were given the option to dance "exhibition" or "competition. 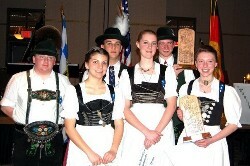 First place Buam was Thomas Olk, D'Heimattänzer, Omaha and first place Dirndl was Lauren Kraft, Edelweiss, Detroit. "Tanzlmusi" played for the Volkstanz in the evening. Watch for the full story in a future Gauzeitung.